Former Scottish amateur champion Graham Lowson, who played out of Auchterarder Golf Club. died on Tuesday. It would have been his 54th birthday today. 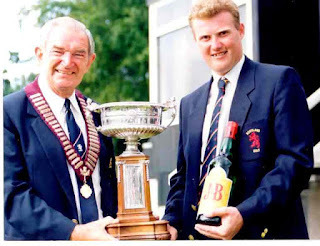 A Scottish international, he won the national title at Downfield in 1991 and is pictured receiving the trophy from Lindsay Stewart (Merchants of Edinburgh), then president of Scottish Golf Union. Lowson had major heart surgery a few years ago. 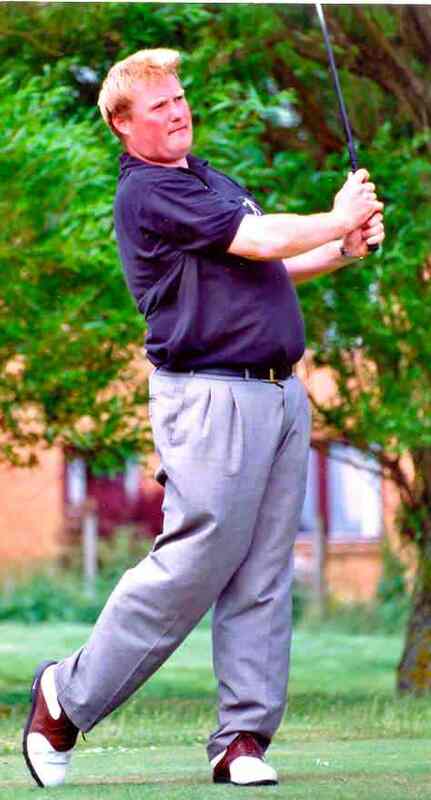 Graham Lowson’s forte as a golfer was match-play. He won far more matches than he lost, not only for Perth and Kinross in county matches but especially for Scotland, which was one of the reasons he was recalled to international duty in 1997-98 after his earlier cap career spanned the 1989-91 seasons. Graham recalled: “I did not badly in the SGU Order of Merit in 1997-98 and got to the quarter-finals of the Scottish amateur in 1997. In the home internationals that year I won two out of three singles, playing No 1! Jamie Donaldson was the only man I lost to. I can remember playing against Justin Rose and Gary Wolstenholme in the foursomes – and lost! Did Lowson ever consider turning professional in the 1990s? “Never. I was never a full-time amateur. I’ve always worked for a living and, anyway, I always thought it would be too difficult to make the grade and a living as a tour pro,” he said. 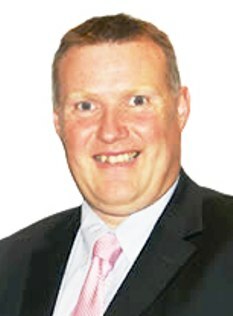 Lowson, area sales manager with First Independent Finance Ltd, was a asset finance specialist for over 26 years “with a particular understanding of turfcare, agriculture, haulage, construction and the small business sector. “I joined First Independent Finance Ltd as the business gave me the ability to offer greater choice and higher levels of trust to my customer base, along with a wide credit appetite and a service that has been proved to be second to none. Graham’s love of golf never diminished over the years but he also enjoyed shooting, walking and training three dogs. SGU past president Hugh Hunter recalls the 1991 Scottish amateur championship at Downfield. “In the semi-finals, Graham Lowson beat Garry Hay (Hilton Park) by one hole while Len Salariya ( Downfield), who was the ‘local hero’/ surprise packet of the tournament, beat Derek Paton (Dunnikier Park) 3 and 2 in the other.